RZD Logistics performs shipping across international transport corridors “East-West” and “North-South”. We provide our clients with high-quality service based on “one window” principle, with all necessary additional services, while guarantying the safety of cargo along the whole route. We organize expedite shipping by means of regular container trains across China-Europe-China with optimal time of delivery – 14 days. The service is organized in partnership with our subsidiary companies – Far East Land Bridge, based in Austria, and YuXinOu, based in China. 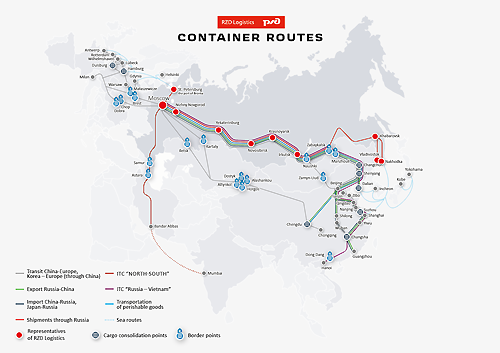 You can find all information on container trains shipment across Russia, as well as across export and import routes in the section “Container trains”. The international transport corridor “North-South” is aimed at ensuring reliable transport ties between the countries of Europe, CIS, Persian Gulf and South Asia. The delivery time from Mumbai to Vorsino (Kaluga region) – 22 days. Transcaspian route: across ports in Astrakhan, Olya, Makhachkala. East route: direct railroad communication across Kazakhstan, Uzbekistan and Turkmenistan through the functional border points. West route: direction Astrakhan – Makhachkala –Samur, then across the territory of Azerbaijan to the planned border point Astara. The new West multimodal route goes across the territory of Russia, Azerbaijan and India. Its length from Saint Petersburg to Mumbai port (city of Bombay, India) – 7200 km. This route presents an alternative to the sea-lane, which connects Europe, the countries of Persian Gulf and Indian ocean (across the Suez channel). In October 2016 RZD Logistics became the first logistics operator on the international transport corridor “North-South”. The pilot shipping was performed in close cooperation with PJSC TransContainer, Azerbaijan Railways and ADY Express. The multimodal route went across the territory of Russia, Azerbaijan and India and included sea, auto, as well as railway transport.